In our last post, we talked about how as professional photographers we diligently prepare for an extensive shoot by mapping out sites, researching sunrise and sunset times, and studying angles of incoming natural light to ensure that we photograph each of our landscape subjects under the most interesting lighting conditions and from the optimum perspectives. These principles are exactly how we’ve been preparing for the monumental scouting trip to Banff, Yoho, and Glacier National Parks that you so generously made possible with your pledge! In this edition, we take it one step further, and reveal how we prepare for shooting landscapes well into the night, long after the sun has gone down - using just moonlight and starlight. With the proper knowledge, equipment, and technique, shooting with very little available light becomes a wonderful reality that will stretch your perception of what’s possible in photography, while the idea of “sleep,” at least in the conventional sense, becomes more of a fantasy! Each of these types of nights produces a distinct set of photographic possibilities, and needs different camera settings. Note that the moon does not have to be a part of your composition, but is merely the source of ambient light by which a night photo could be made. This is an example of a night landscape taken under a full, or nearly full, moon. The geyser in the foreground is so well lit, it essentially looks like it was taken during the day. The moon is as direct and harsh a light source as the sun; it just isn’t as bright. Cranking your ISO setting up and using a longer exposure time effectively makes moonlight look like a paler, bluer version of sunlight. Note that a full moon also brightens the sky, reducing the number of visible stars to just the few brightest in the sky. Shooting by moonlight with clouds in the sky softens the light, just as it does with sunlight. Shooting on a new moon night, where the moon casts no light at all, ensures that the only natural light sources you’ll see all night will be stars. Without any significant amount of light to illuminate your surroundings, the foreground of your composition will remain as a silhouette even with a longer exposure time, while the background, on a clear night, will show more stars than you can count! The crescent moon night is the most versatile for photography. A waxing crescent moon is typically visible in the sky during the daylight hours, and it remains in the sky for a few more hours after night falls, which casts a very dim light on its surroundings. It sets at some point during the night, leaving you with a pitch black sky, not unlike the conditions created by a new moon. This moon is the best of both worlds: It casts enough light to illuminate the foreground over a long exposure, but little enough light to allow all the stars to show up in your photos! AND it sets, so you can still make no-moon photos with silhouettes late in the night if you wish. Each type of night creates its own technical and artistic restrictions, and knowing ahead of time what kind of night you’re in for tells you what kind of shots you can and can’t expect to make. Now onto the actual research and pre-scouting; Many of the tools that were useful in daytime, dawn, and dusk pre-scouting will also be invaluable in preparing for night shoots. If you haven’t done so already, please look over our earlier post on Research and Planning to get an idea of the tools and skills we’re now elaborating on. 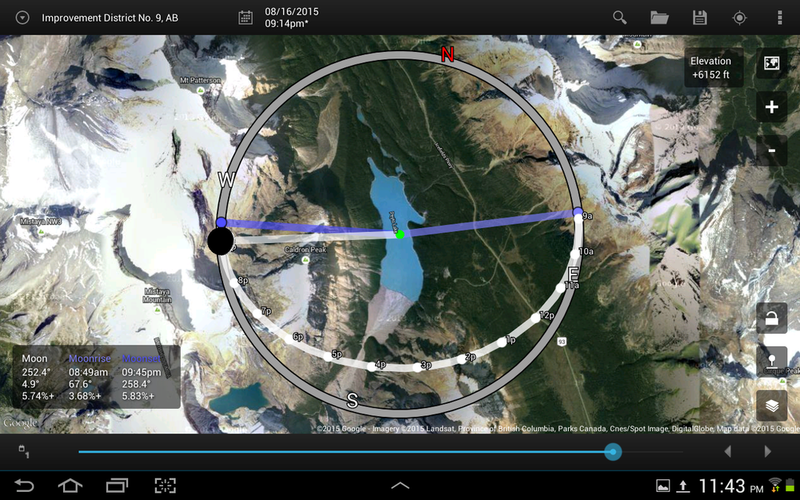 Using the same sites we pinned in Google Earth the first time around, we open Sun Surveyor once again. Here we’re looking at the same familiar location from last time - Peyto Lake in Banff National Park - but this time we pay attention to the part that’s not about the sun at all. We've simplified the readout to exclude sun data, so we can look at just the moon details. We see that for August 16, (the first night we plan to be at Peyto Lake), the moon will be a very small crescent. The light and dark blue lines point to where the moon will rise and set respectively, and the white dotted arc shows the path of the moon through the sky and where it will appear at certain times of day/night. The box on the lower left tells us the exact moonrise and moonset times. So now we have all this great data - BUT, the only important question is: What kind of shot can we hope to make at Peyto Lake on this night?? We know from our dawn/dusk pre-scouting that we did last time that sunset is at 9:07 PM. So let’s say two hours later it’s pretty much completely dark out, and we’re ready for some night shooting. Well, we see from our Sun Surveyor data that our crescent moon has set 9:45 PM, so for the rest of the night, there will be no moon in the sky whatsoever. Thus, the conditions we’re shooting under will be similar to new moon conditions, and the only shots we can hope to make with ambient light will be starry skies with silhouetted foreground elements, IF the sky is clear. If we wanted to make the kind of shot where the crescent moon illuminates the ground for us AND we’re able to see stars in the night sky, our only option is to wait a few more nights until the moon waxes a bit more, and sets later in the night. The moonset time is getting later by 20-30 minutes or so each day, while the sunset time is only changing by 2-3 minutes. Here, we’ve advanced to August 20, and I’ve put the sun data back in, so we can see it alongside the moon data. We see that on this night, the moon is a much larger crescent, and it sets at 11:21 PM - about an hour-and-a-half later than it did on August 16. The sun is setting at around 9 PM, so if we were to go out and shoot two hours after sunset, we would still have some time to take shots under the crescent moon before it sets! As we advance day by day, the moonset time gets later and later, as the moon gets fuller and fuller, and we adjust our expectations and strategies accordingly. As with all nature photography, you can’t expect to always be able to make the shot you want when you want it, but by having a solid understanding of the cycles of the night you can at least know what scenarios to prepare for after the sun has gone below the horizon. And remember, as always, that the tools we use are just guides to help us in our planning, but there is no substitute for seeing the landscape in real life and adapting to the conditions that you are observing with your own eyes. Practice using Sun Surveyor before your next photo trip to learn how the moon operates, and how it’s patterns overlap with those of the sun. There’s a certain charm to working within the constraints of the non-negotiable rhythms and cycles of nature and the sky, and by expanding the scope of your photography to include the night, you will hopefully be able to create captivating, innovative images that will lead you to wonder why we would ever even take the lens cap off in the daytime!